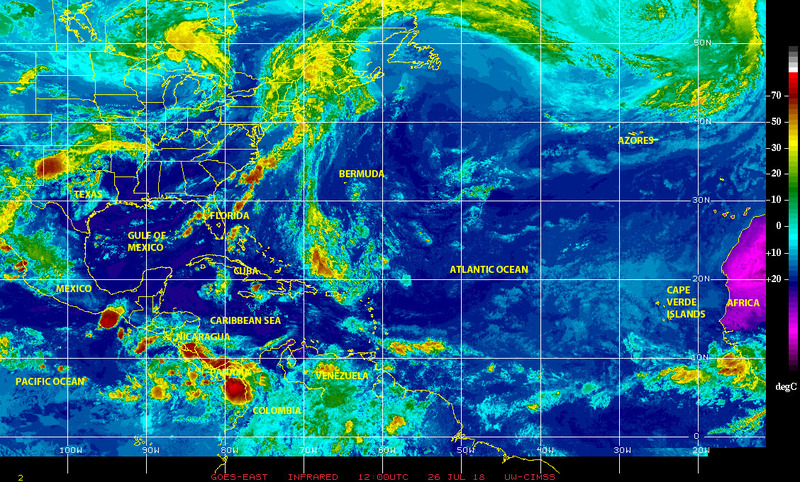 26 July 2018: What’s happening in the Atlantic hurricane-wise? The initial round of predictions for the 2018 Atlantic Hurricane Season called for “above average” activity in the basin. That forecast was downgraded during subsequent rounds of ‘revised’ predictions, mainly because of an incipient ENSO signal off the pacific coast of Peru, which may generate a somewhat adverse environment for cyclogenesis over the Atlantic. Of course Mother Nature will do as she pleases, so we’ll have to wait and see what actually happens during the remaining 127 days of the ‘official’ Atlantic season. Although the season got an early start with Alberto in May, and two other named-storms, Beryl and Chris have activated and lived in the Atlantic since, but things have been somewhat quiet lately. On this Thursday 26 July 2018 satellite imagery shows a largely calm ocean-atmospheric environment over most of the Atlantic basin, except for a train of minor tropical waves and disturbed weather cells riding along Hurricane Alley between the Atlantic coast of Africa and the Windward Islands, the gate to the Caribbean. 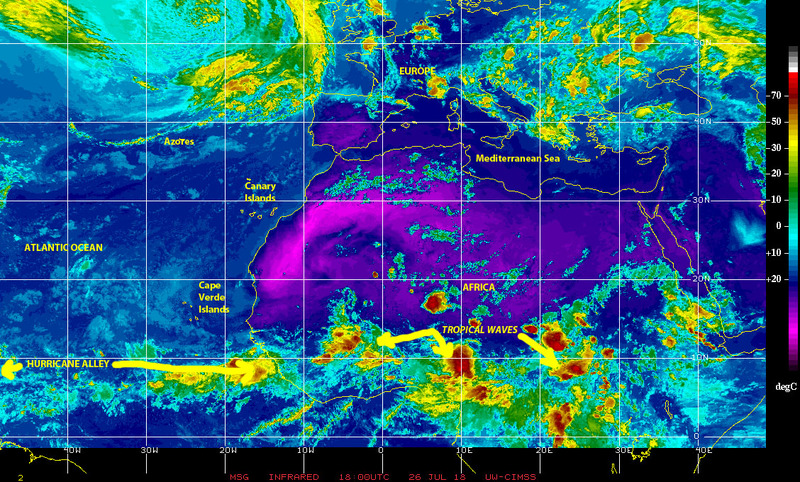 Looking farther east through Equatorial Africa there are a few tropical waves moving westward along the assembly lane, but nothing that causes concerns for possible tropical cyclone activity over the next few day, at least. So all we can do is watch and wait as we start to approach what historically has been the most active part of the Atlantic season from around mid-August through early October. 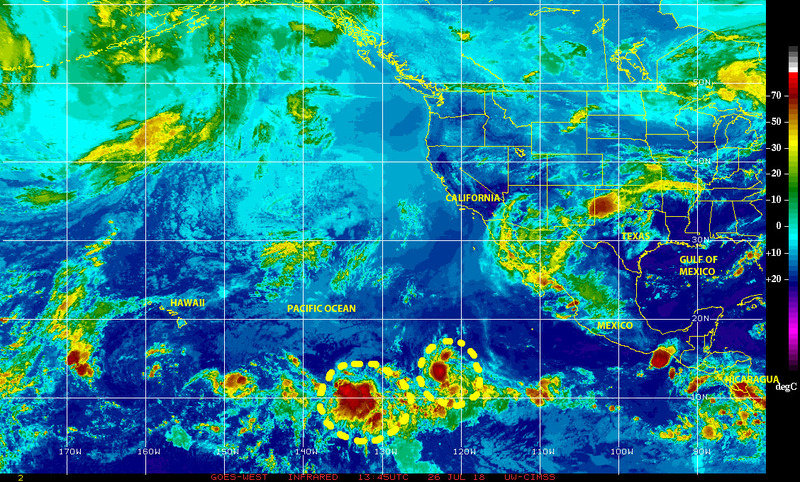 Elsewhere tropical cyclone activity has been quite active at both extremes of the northern hemisphere Pacific Ocean, with numerous storms and tropical waves hitting over the East Pacific off the coast of Central America and Mexico and near Hawaii, as well as over the Northwest Pacific and sub-basins of the Philippines Sea, and South China Sea. The Philippines, Taiwan, Viet Nam, China, South Korea, and Japan have all suffered hits, some of them more than once, from tropical storms and typhoons in 2018. 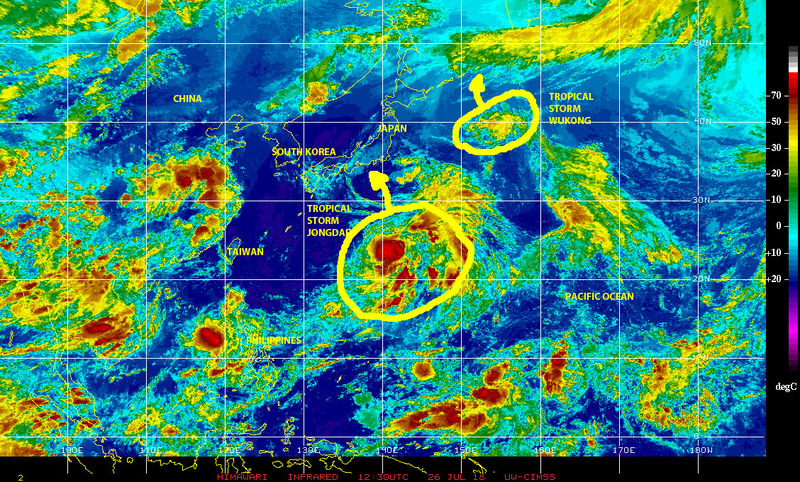 On this 26 July satellite imagery shows two tropical storms, Jongdari and Wukong, moving toward potential landfalls in south-central as well as northern Japan, while some 11000 kilometers to the east over the East Pacific we are tracking two strong tropical waves between Mexico and Hawaii, which are showing some tendency toward possible cyclonic activity. Previous PostACERCA DE LLUVIAS TORRENCIALES E INUNDACIONES EN NICARAGUANext PostAugust 2018: the Pacific Ocean is Agitated!